Description: Oro-Con is Oroville’s own Comic Con, and it’s coming back to Feather Falls Casino! FREE admission, open to all ages! We have a great day planned for everyone! 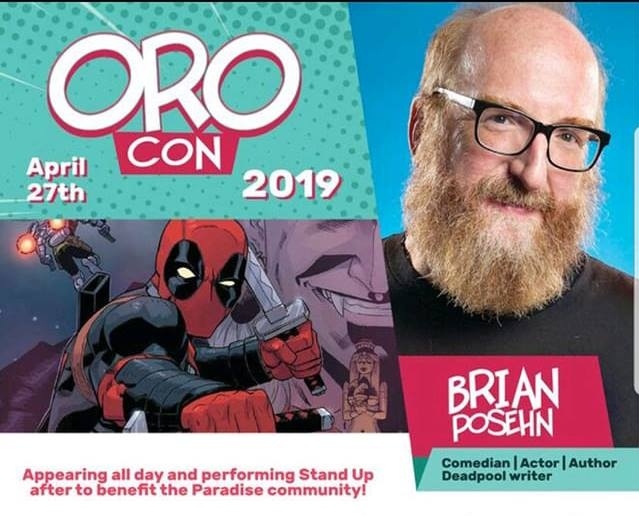 Come out and meet our special guests Brian Posehn: Comedian, Actor, Deadpool author! Kenneth Rocafort: Superman and Teen Titans artist! Tim Bradstreet: Punisher and Constantine artist! Scott Koblish: Deadpool and G.I.Joe artist! The Art of Megan E. Risk: Author/Illustrator of Marionette! Robert Love: Dark Horse and Image Comics Creator/Illustrator! Chris Marrinan: Wonder Woman and Spider-Man artist! Plus artists and local Nor-Cal comic creators and new vendors from as far as Southern CA!